The start of a new week means a new partner, new station, and new cleaning duties. I’m in station 3 this week with my new partner. 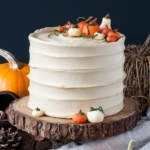 He’s relatively new to the baking world and had mentioned last week that he’s never baked anything in his life! 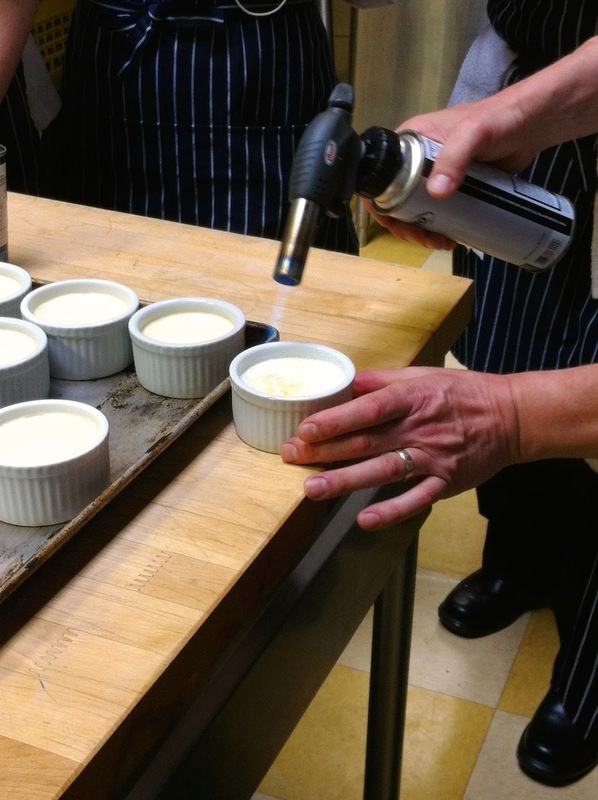 He’s taking the full year culinary+pastry program, but since culinary was full, he’s starting with pastry. It was actually really good that he called this out. I think I assumed that everyone in the pastry program has at least baked something in their life; this isn’t necessarily the case for the full year students. Knowing this, I tried to be as patient and helpful as possible. I was asked to be the Team Leader this week, which means I’m responsible for making sure the ingredients are measured out for each team for each recipe. The Team Leader co-ordinates and delegates the scaling of each ingredient to the rest of the students and makes sure everything is in place correctly. This week had a variety of things going on. 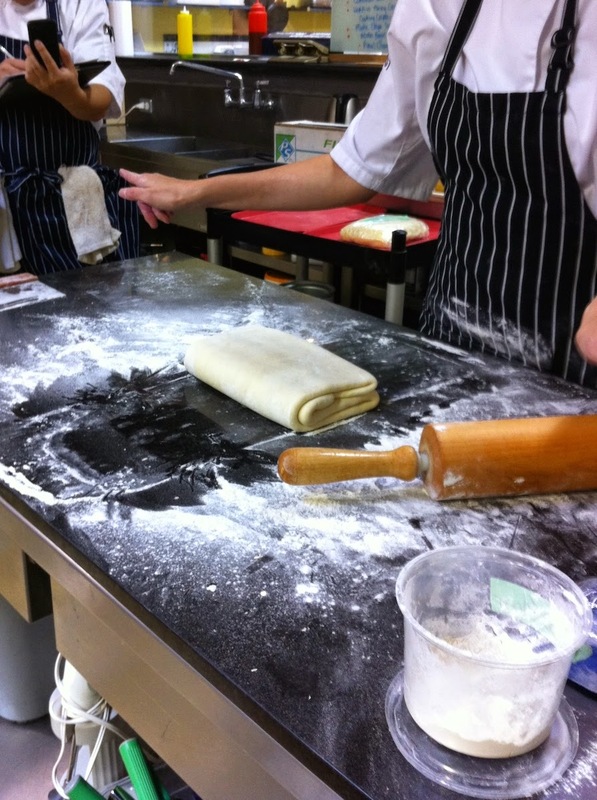 Early week focussed on muffins and custards and we ended the week with a TON of puff pastry. 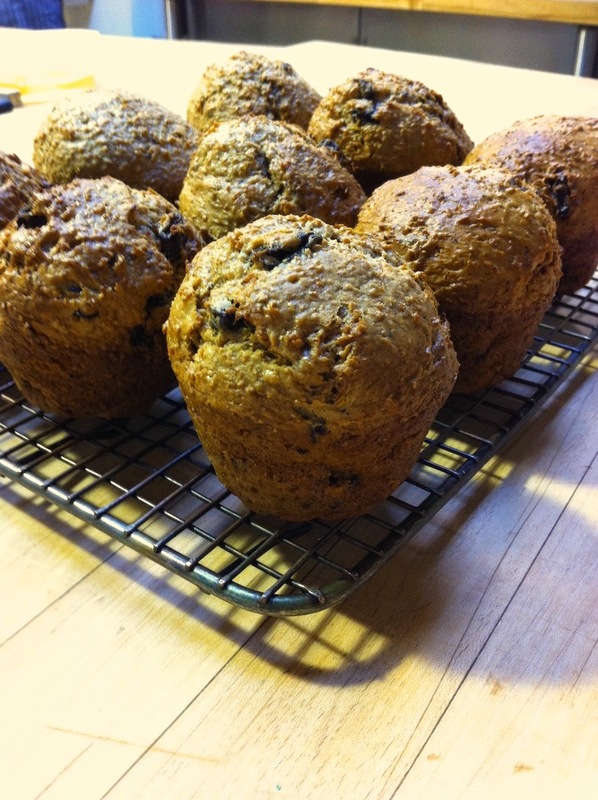 The theme for today was Quick Breads — quick to make and quick to bake. A welcome change from some of the not-so-quick cookies last week. 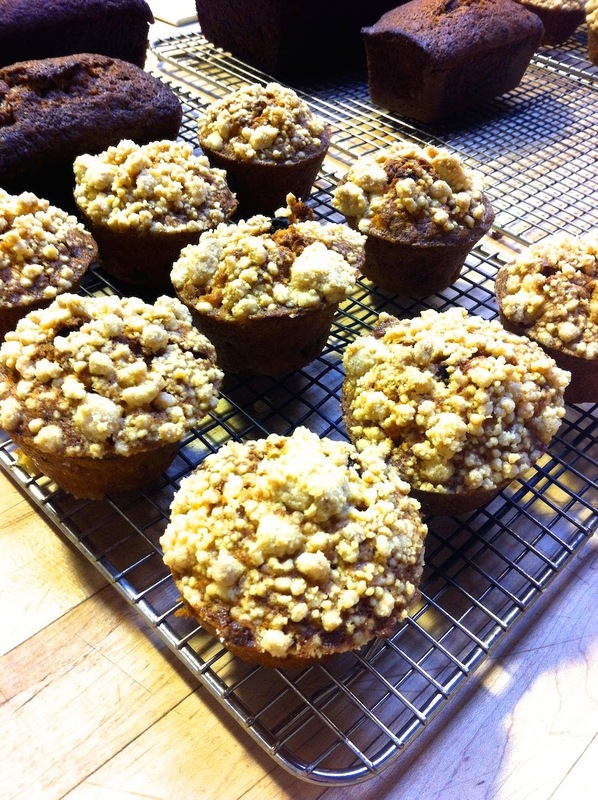 First thing we made was streusel as a topping for the Morning Glory Muffins. 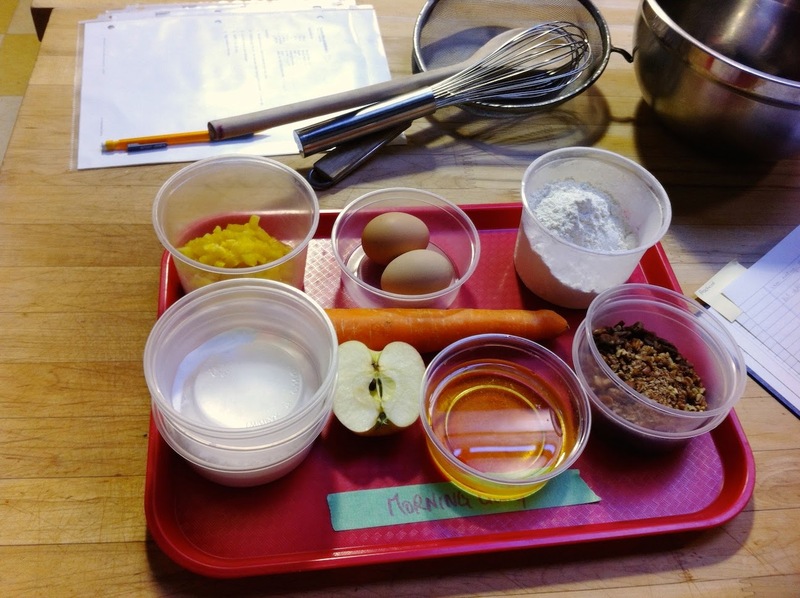 Scaling the ingredients was especially challenging today, as some recipes had over 15 ingredients each! Thankfully everyone seems to be detailed and efficient with the scaling, so it comes together pretty quickly. 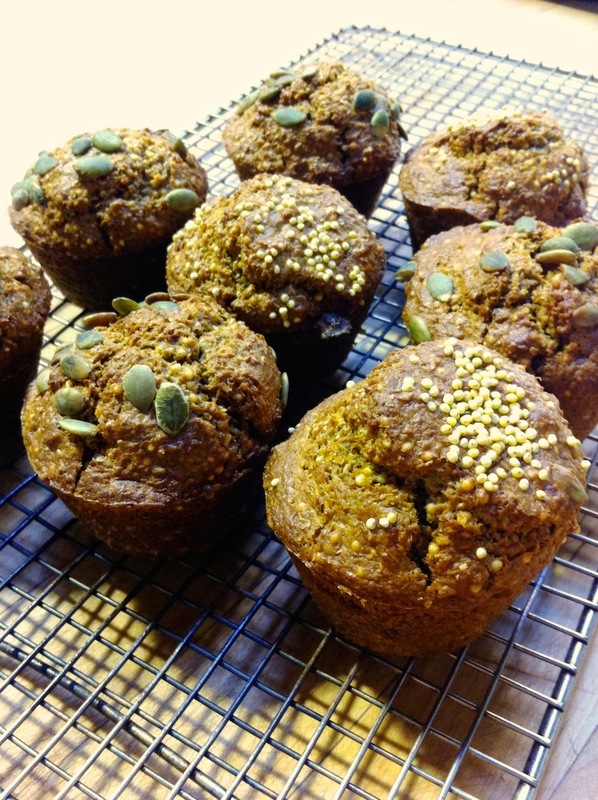 Here are *some* of the ingredients for the Morning Glory Muffins. The tubs on the bottom left are quadruple stacked with stuff. 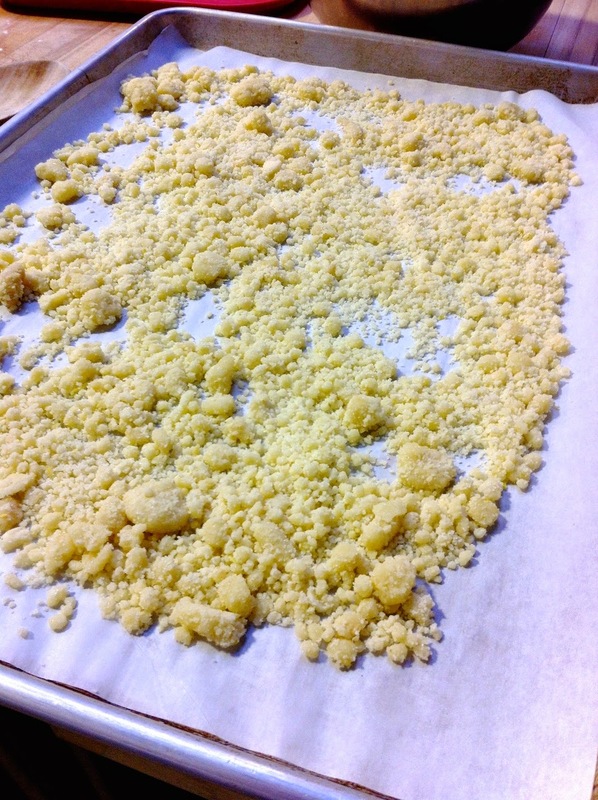 Topped and ready for baking! Fresh out of the oven (I lie, this picture was taken hours later). These ones are PACKED with stuff. There’s not a lot of actual “batter”, it’s mostly additional ingredients like apple, nuts, raisins, etc. 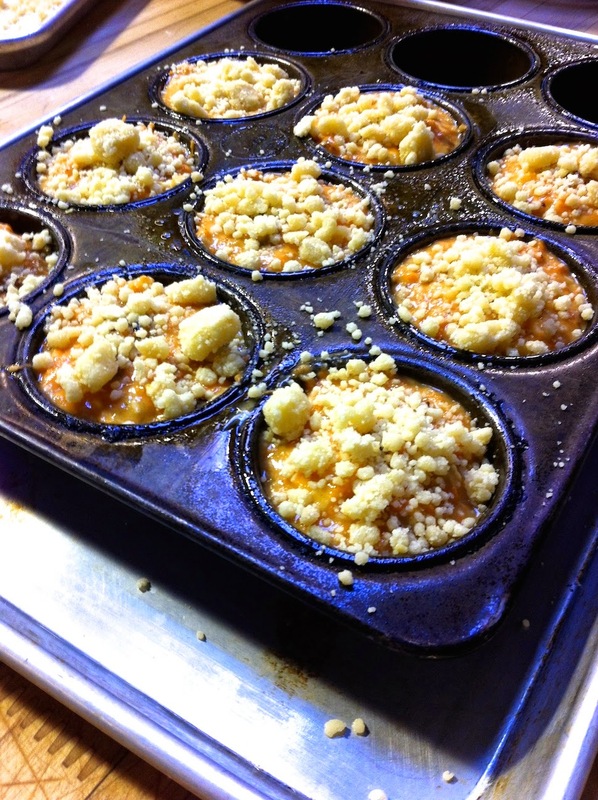 These need to be baked extra long to ensure they are fully cooked through. If they’re not, they’ll break apart when you try to get them out of the pans. 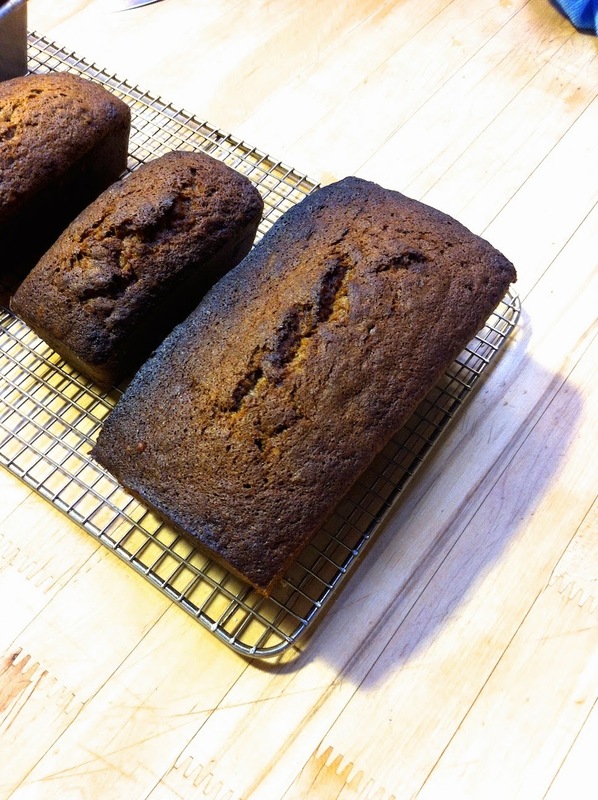 Next up was banana bread – your typical recipe (though mine always includes chocolate chips). Our large loaf got a bit burnt in baking :(. The little guy turned out all right though, and both taste delicious. 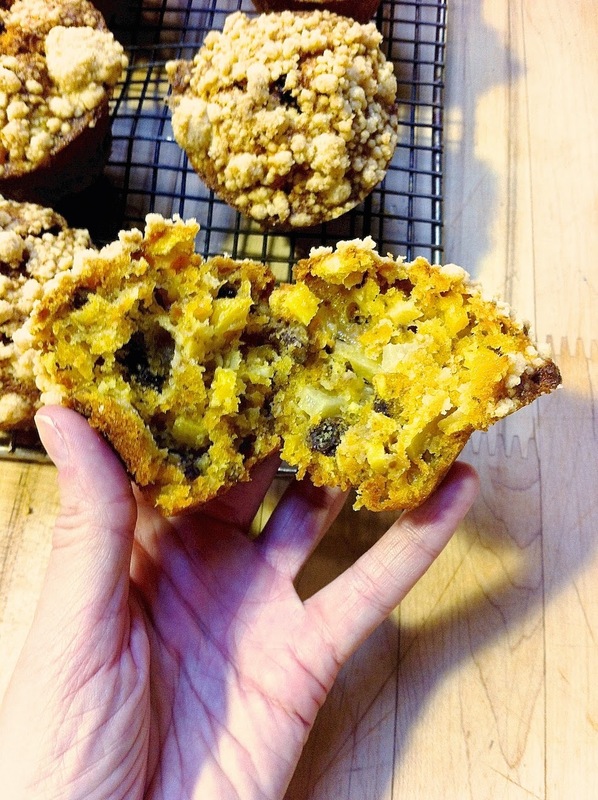 Like chocolate chip cookies, it’s hard to go wrong with banana bread. And finally scones. These were SO good. I haven’t made scones before, and most of the ones I’ve had tend to be on the dry side. These were simple buttermilk scones and they were amazing. I have my husband, Ryan, taking some of my baked goodies to my old work friends… the scones didn’t make it in (neither did the macarons – sorry!). 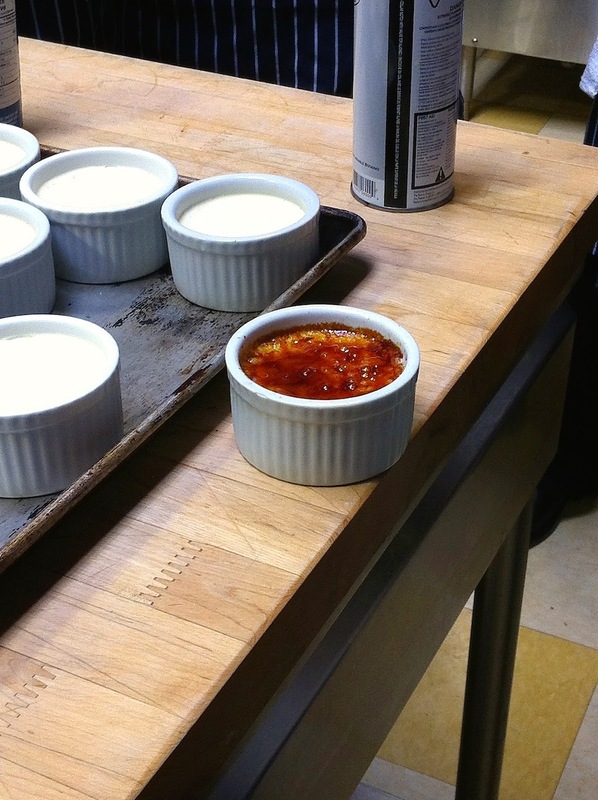 We finished off the day with making the base for Creme Brûlée, which sat in the fridge overnight to be baked the next day. Earlier in the afternoon we also made the batter for the Sour Cream Bran muffins, which also sat overnight for the bran to do its thing. This day was all about creams and custards, and I am grateful that only one day was dedicated to this. As easy as they seem to make (they kinda are), it’s stressful! Pouring HOT milk/cream into eggs while trying to make sure they don’t scramble, trying to ensure said hot milk/cream doesn’t burn/scald while you’re cooking it, boiling various things to a certain exact temperature (even ONE degree off and it could ruin what you’re making), etc. See? Stressful! 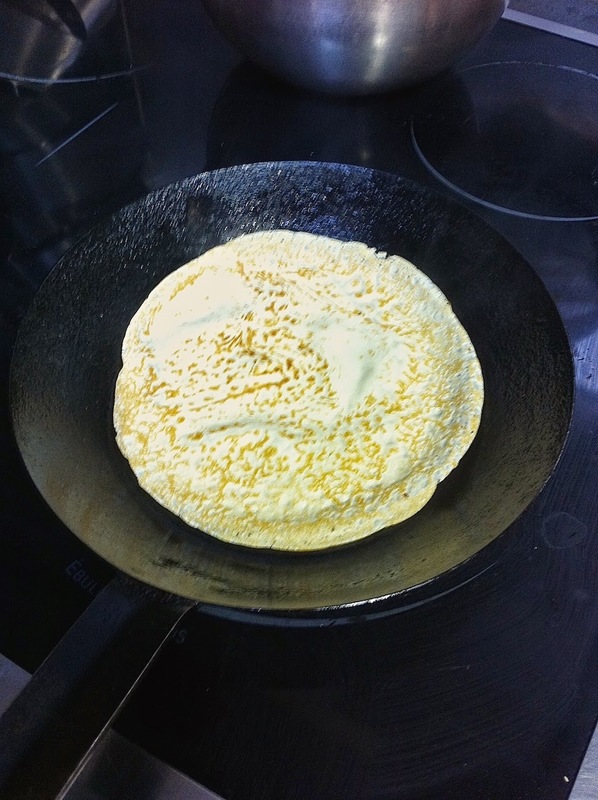 I’m being a bit dramatic – it actually wasn’t that bad – and we did a lot of recipes this day using similar methods (hot milk/cream into eggs), so I think everyone is a pro now. 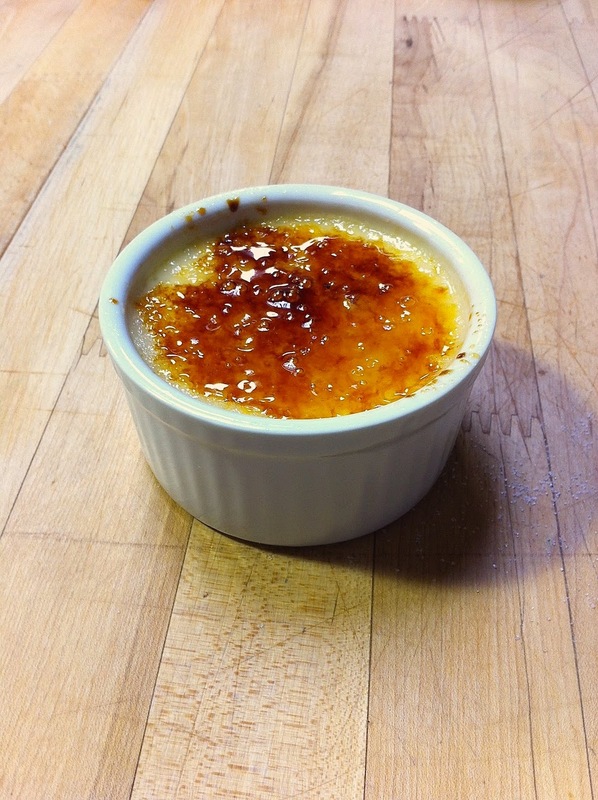 … and also baked up the Creme Brûlée. All set up to bake in bain-maries (water baths). 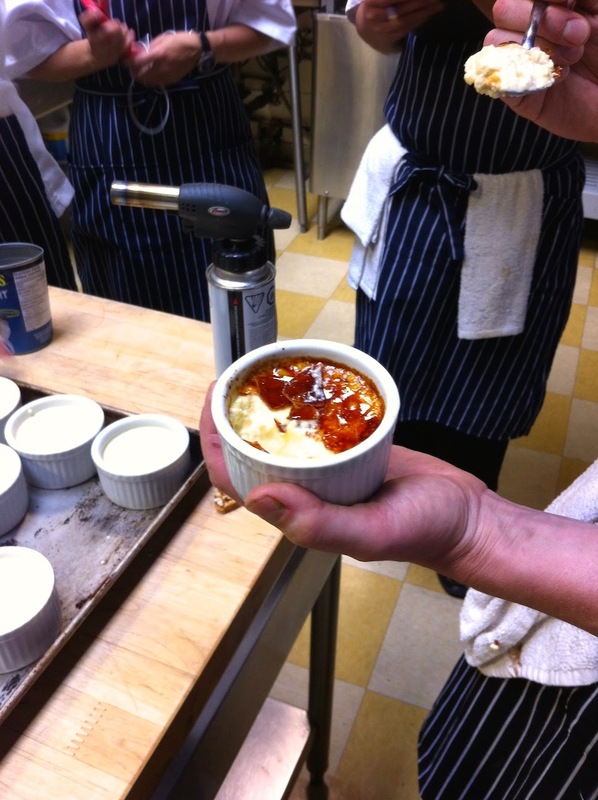 Post-baking and chilling torch demo from our Chef instructor. After the demo we got to torch our own. I didn’t put enough sugar on mine initially, so I had to add more as it wouldn’t properly caramelize. Not gonna lie, I ate the entire thing. No shame. Other than that, we made a whole bunch of creams and custards that I didn’t take pictures of, as they were to be used the following day. One thing I did snap a pic of was the Posset. Our instructor made this as a demo for us. 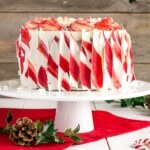 It’s a very light cream infused with a whole bunch of flavors. I honestly can’t remember what they were. All I remember is star anise and lemongrass, but there was a bunch more. It was tangy and delicious. 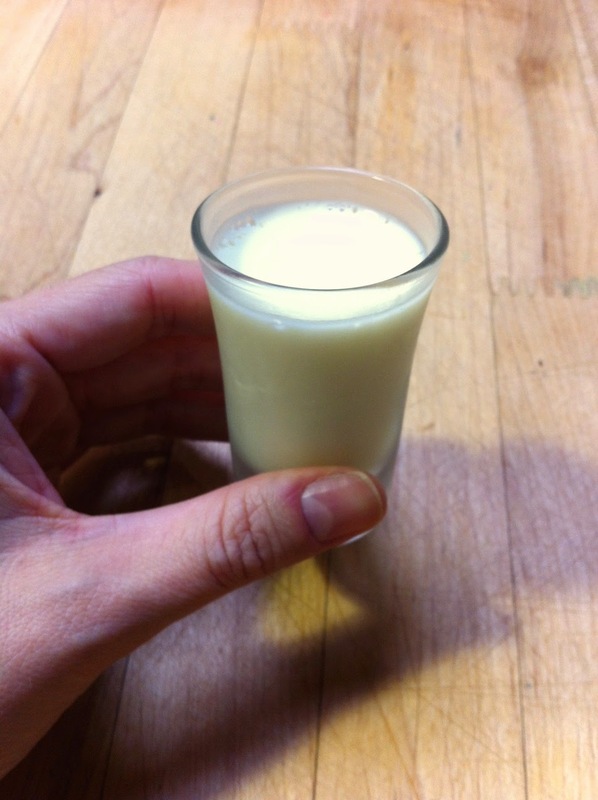 I also ate the whole thing, but its a tiiiny shot glass, come on! Aside from Creme Brûlée, I’m not really a fan of creams and custards. 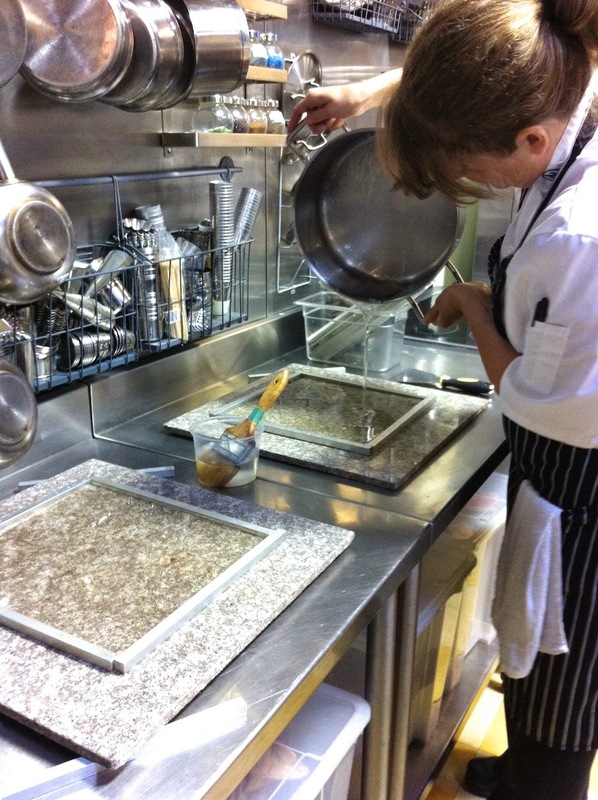 Especially the ones that set to a jello-like consistency (I’m looking at you, Creme Caramel). 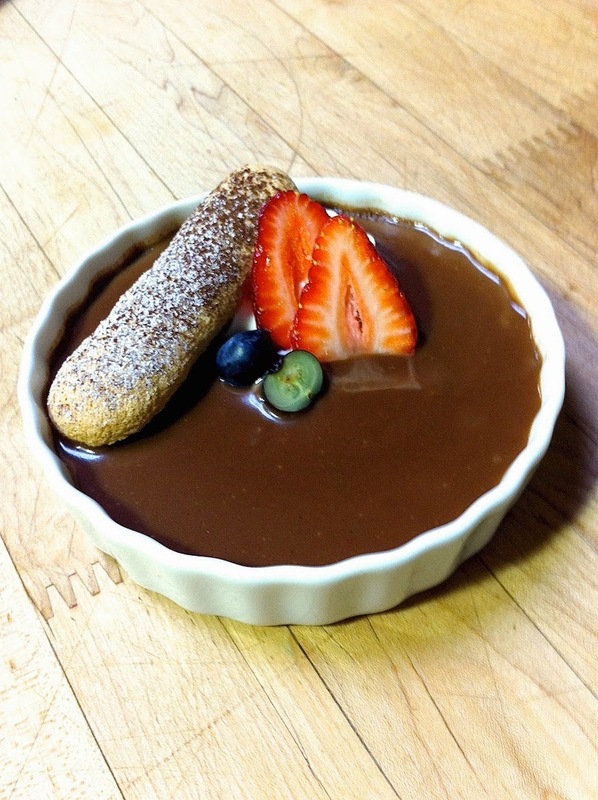 We started this day by plating our Creme Caramel and Chocolate Pot de Creme from the day before. 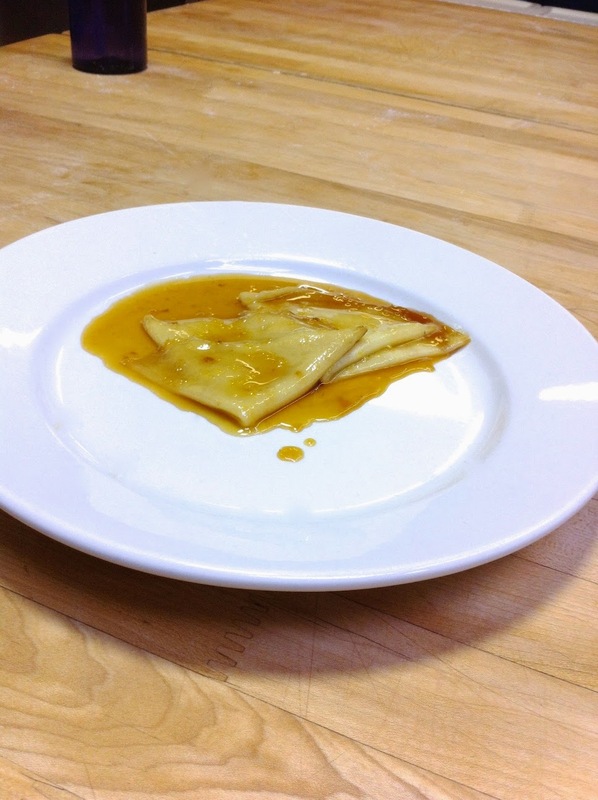 Presentation is a huge part of the dishes we make, so it’s important to learn and practice good plating techniques. Since this was our first time doing it, we basically copied what the instructor did. In future platings we’ll have more opportunity to add our own flair. 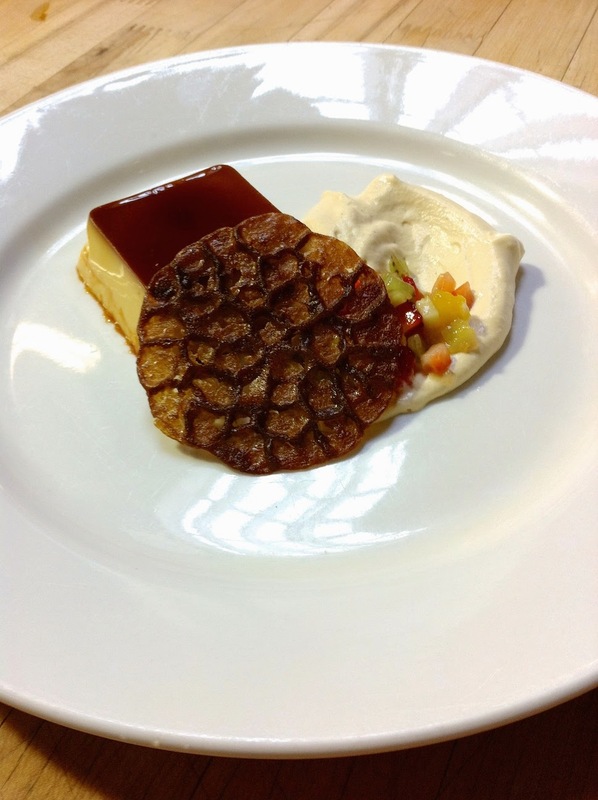 For the Creme Caramel, I could have done a better job on the whipped caramel on the side. My swoosh thing isn’t as nice and clean as it should be, and I used too much of the cream overall. I also should have put the mixed fruit higher up into the cream. 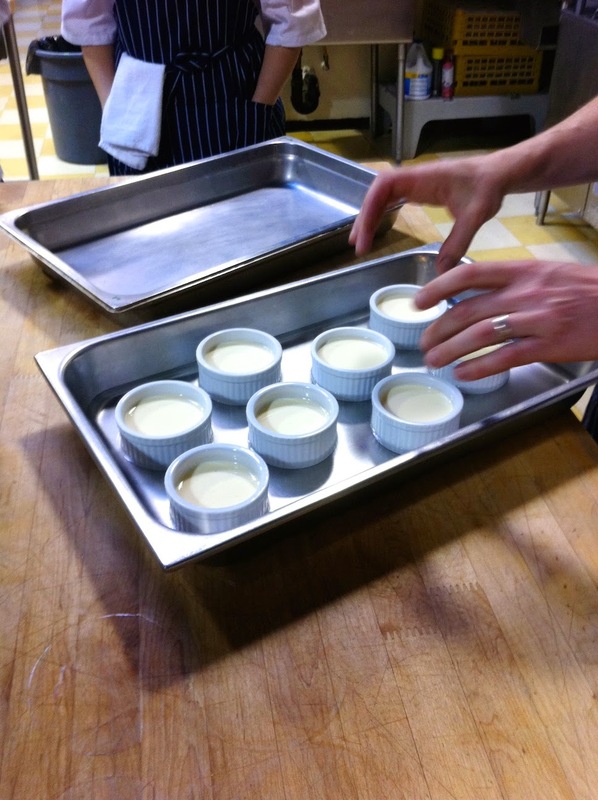 For the Pot de Creme, I wish I had used more of the Posset from yesterday! You can kinda see it peeking out behind the strawberries, but just barely. After the plating was done (and sampled), we moved onto Choux Pastry for the rest of the day. Choux is the pastry that is used for things like eclairs and profiteroles (to name a few). It has tons of air pockets and a firm shell. These are typically filled with a variety of different creams or fruits. 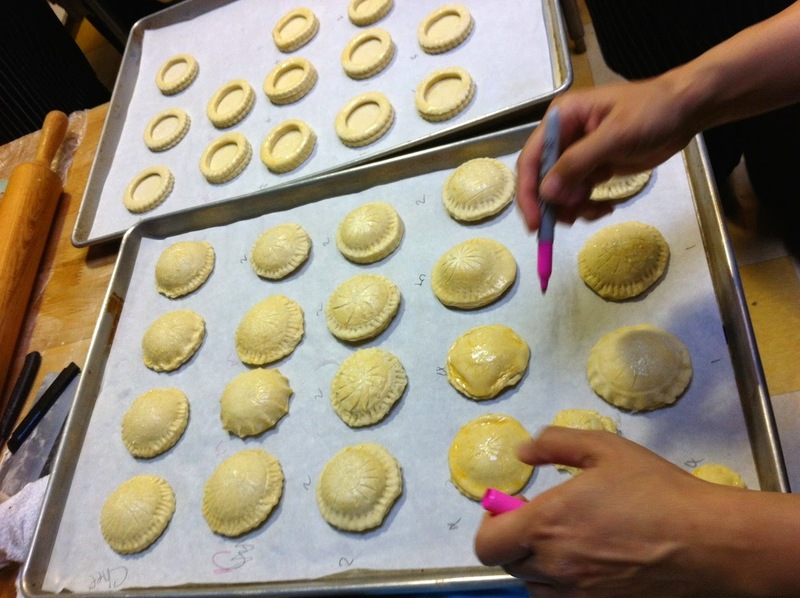 Once ours were baked and cooled it was time to fill and decorate them with the creams we made. Our Chef demonstrated the various techniques and showed us different ways we could style each one. Paris Brest on the left (filled with a hazelnut cream), your standard eclair in the middle filled with chantilly cream, and a pretty swan on the right. Unfortunately these don’t travel well/keep long, so I didn’t take any home. I promptly devoured a profiterole and half a Paris Brest. 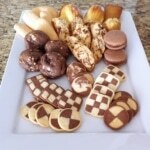 The rest were given to the culinary students (lucky them!!) and to the food bank. Come to think of it, I don’t think we got anything from culinary this week. Boo to that! My day started with my binder falling on the floor and spilling some of its contents. While I was cleaning that up, I knocked over my water bottle and tried to catch it, but instead knocked it clear off the table and onto the floor. It was going to be one of those days… Later in the day I also managed to drop a rolling pin onto the floor. 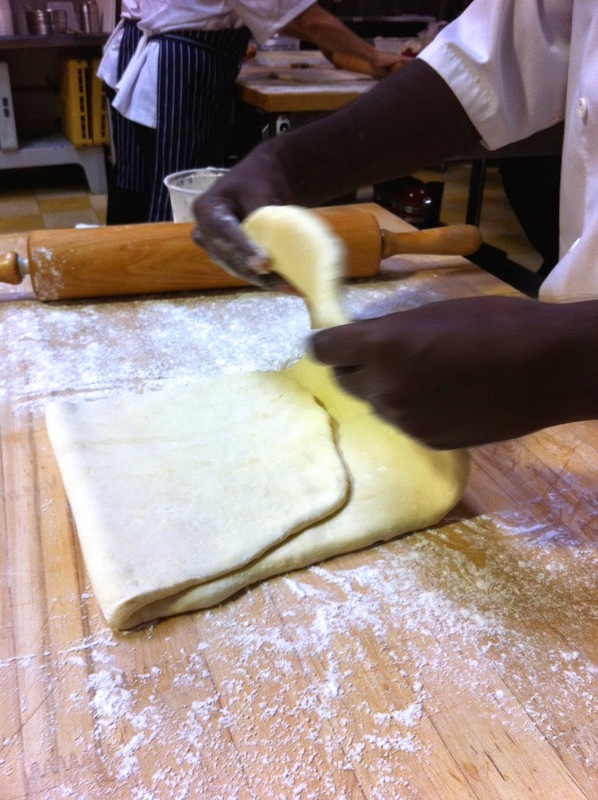 Today was all about laminated dough which is essentially puff pastry dough used for things like croissants, danishes, etc. We learned 2 different methods to do this: the German and the French. The German method involves enclosing a HUGE slab of butter in dough, and the French is enclosing a dough in a thick sheet of butter. Craziness! SO. MUCH. BUTTER. It’s basically a 50/50 ratio of butter/dough. Think about that next time you pick up a croissant… actually no, don’t think about it, just eat it in all its flakey deliciousness. 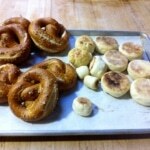 We started out making the German dough first. One person had to create the dough and the other had to beat the pound of butter into oblivion. 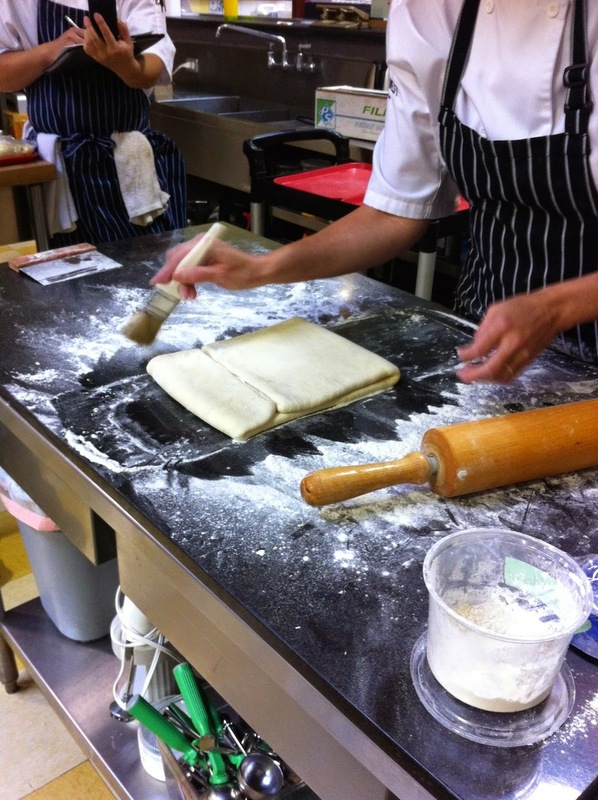 Literally, we were whacking it with rolling pins until it was soft and pliable (but not too soft) and incorporating with all the flour. I started on the butter while my partner on the dough. My partner was visibly distracted today and not 100% on his game. He was aware of this and apologized for it, and told me about some personal issues he was dealing with. I completely understood and sympathized. It did add a layer of stress, as there was a LOT to get done and we were falling behind, but we managed to catch up and get everything done. I wasn’t on top of pictures either, so I forgot to take a pic of us enclosing the butter slab with dough. I did remember to get a pic of the dough being enclosed in butter, probably because it’s so ridiculous! Once the dough/butter is enclosed it needs to chill for a bit. Then begins the rolling and folding. 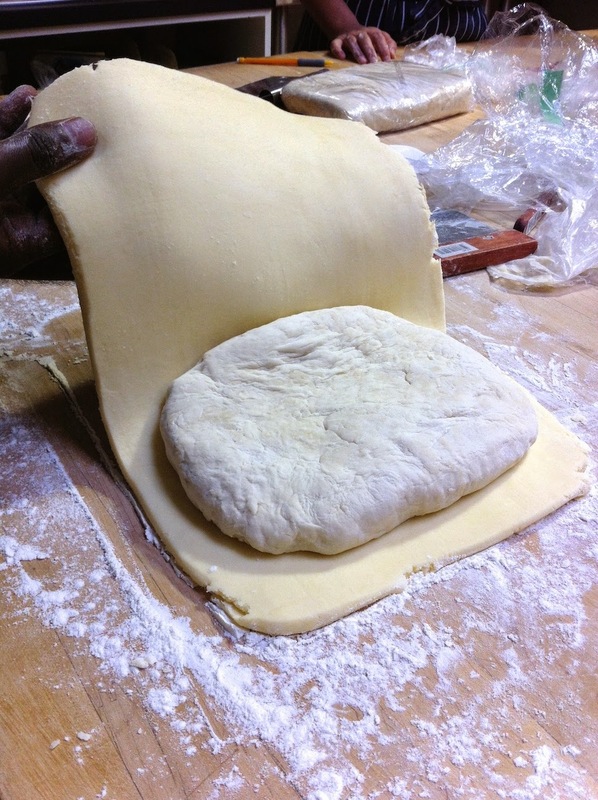 Then you let the dough chill for another 30mins, roll it out again to the same 24″ and do a double fold. And our perfectly double-folded German pastry with the single folded French one in the background. This process is repeated a few times… single fold, chill, roll, double fold, chill, roll, single fold, chill, roll, double fold, chill. Once the dough is ready, there are 145 layers of dough and 144 layers of butter for the German version. 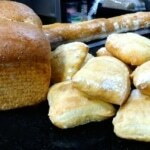 French is 145 layers of butter and 144 of dough. It’s a LOT of work, especially doing both at the same time. 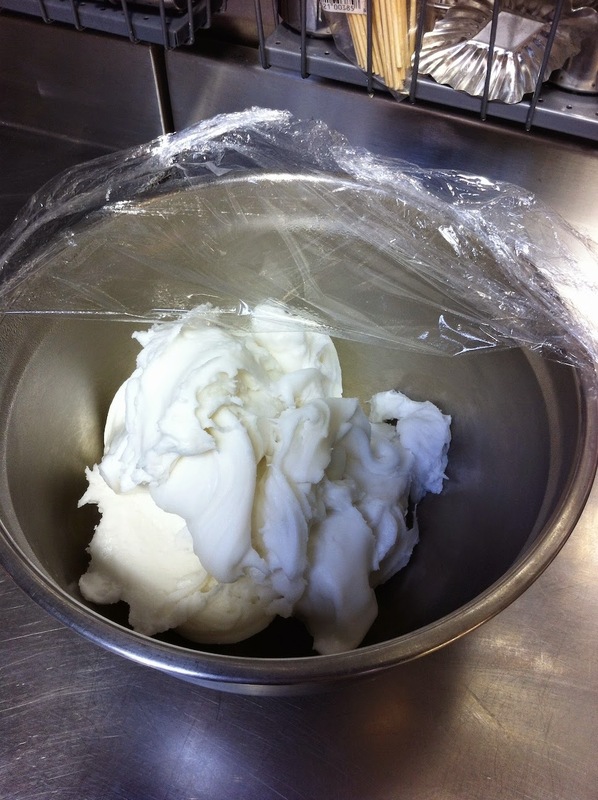 Once completed, we set the dough to chill overnight. 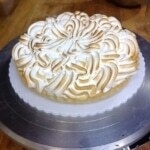 I’m quite confident that the hard work will pay off once we bake off all the various pastries! I forgot to take a pic of our dish, so the one above was done by one of the girls in class (hers looked better than ours did anyhow :)). The crepes were yummy. 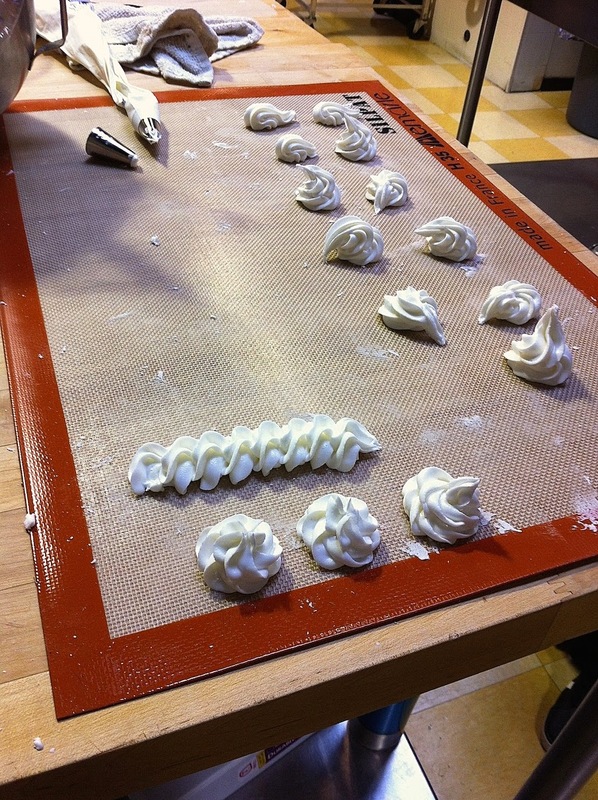 Finally, we ended the day with some royal icing and piping practice. 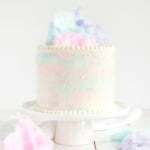 This day started with me wondering if we were actually going to use 3kg of sugar per group to make European Fondant. That is a lot of freaking sugar! Thankfully, Chef Stacy made one half-batch for the entire class to show us the process. You start with heating the sugar, water, and glucose in a pot to some temperature I can’t remember and am too lazy to look up. 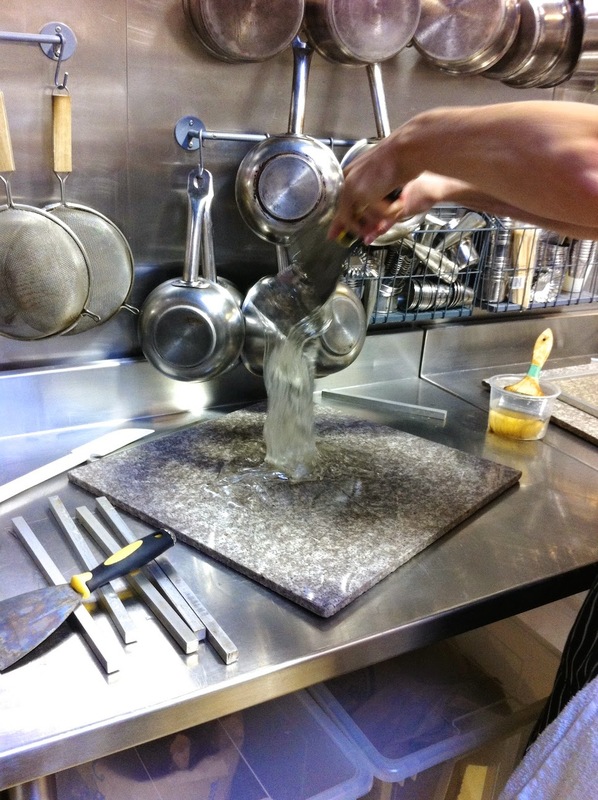 Once it’s ready, you pour it onto a marble slab and let it cool to 43° (?). Then you start kinda pulling it until it reaches a white color. Once white, it’s ready for use. 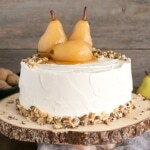 This was heated up a bit, and then drizzled over our finished pastries at the top of this post. 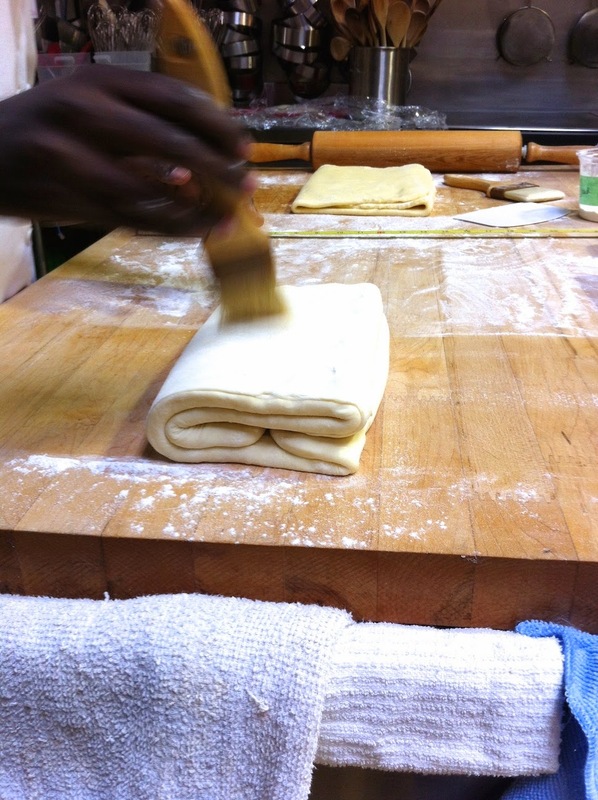 Next, we broke out our puff pastry dough from the day before and started rolling it out into various shapes. A cross-section shows all the buttery layers! We started with the German dough. Cream horns and hazelnut twists. Hazelnut cream filled puffs with Vol au Vents in the background. Getting an egg wash and prepping for the oven. I really wish I had taken a picture of the pan and parchment they were on. They were literally floating on melted butter!! 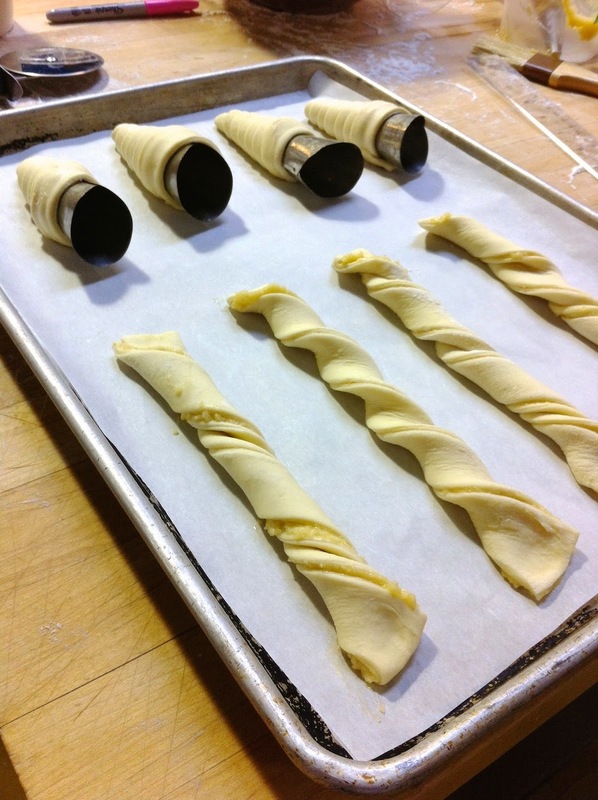 From left to right… Feuiletee, Pinwheels, Diamonds, Bear Claws, Turnovers. Most of these didn’t stay closed, which was a bummer. But they had a serious amount of puff! More than the chef was expecting I think. Regardless, they tasted delicious! 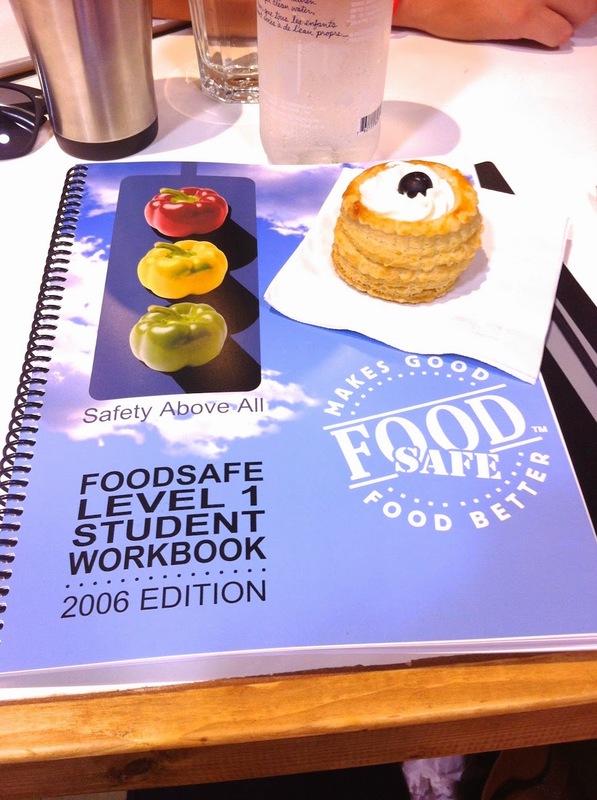 A bunch of us had to go in on Saturday this week to take a Food Safety class. We learned about proper food handling procedures and danger zones for heating and cooling foods, as well as different bacteria and things that can cause food illnesses. 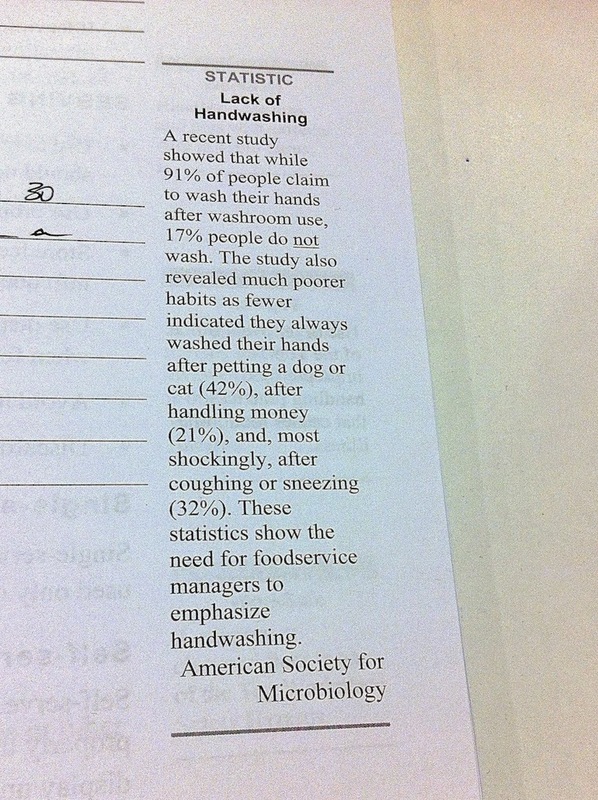 We also learned that people are disgusting. But seriously, who ARE these people?! Gross. Chef Ian, one of the culinary instructors, taught the class and managed to make the incredibly dry material fun and entertaining. That’s a wrap for week 2! We learned a ton of different things, and it was a nice change from cookie week. We also got to know our team members a bit better. Most of the other students I work with are awesome – fun, hardworking, eager to learn, just really what you’d want a team to be. There are a couple in particular I’m not looking forward to grouping with. The first one is very disorganized, unprepared, and doesn’t seem to have a clue what’s going on. The second is unbelievably rude, does not communicate (!! ), and generally just doesn’t seem to want to be there. The first person I can manage to work with. They’ll need a lot of hand-holding and direction, but at least I feel like I can maybe accomplish something with them and maybe help them. The second person just doesn’t know the meaning of teamwork, and I know they will be an incredibly difficult partner. Overall, this week was a huge improvement from week 1 for me. I kinda feel like I’m already through the transition phase that usually takes me a month, so that’s kinda weird (I’m ok with it though). Next week I’m on my own, since we have an odd number of students in our class. I am ok with this since I feel like I work better on my own, but I’m sure it will be challenging to do the work of 2 people! I keep checking the forecast for Friday. We’re going to Terra Nova Farms in Richmond that day, and it’s supposed to POUR. I’m really hoping the forecast changes by then! !